The NBA Hall of Famer Shaquille O'Neal is joining the Papa John's board of directors and is investing in nine locations in the Atlanta area, the company said Friday. He will also become a brand ambassador for the pizza chain. "We are thrilled to partner with Shaquille and welcome him to the Papa John's board," Jeff Smith, the Papa John's chairman, said in the press release. "Shaquille has an excellent entrepreneurial background, including as a restaurant franchise owner, and is a natural creative marketer." O'Neal is no stranger to the restaurant business. He owns a Krispy Kreme Doughnuts franchise in the Atlanta area and has previously owned 27 Five Guys Burgers and Fries locations, the press release said. He also owns a fast-casual fried-chicken restaurant in Las Vegas and a fine-dining restaurant in Los Angeles. Friday's announcement comes amid a shake-up at the pizza chain. In February, the hedge fund Starboard Value invested $200 million in the company and named its chairman as CEO. A month later, Papa John's settled its dispute with its founder, John Schnatter, who agreed to drop a lawsuit and resign as an independent director. Schnatter still owns about 30% of the chain. Papa John's is seeking to reshape its image after Schnatter's exit from the company's operations. In December 2017, Schnatter stepped down as CEO after facing backlash for his criticism of NFL national-anthem protests. Then, last July, he stepped down as chairman after admitting to using a racial slur on a company conference call. In its most recent earnings report, Papa John's said it spent millions of dollars on "reimaging costs" at the end of last year. 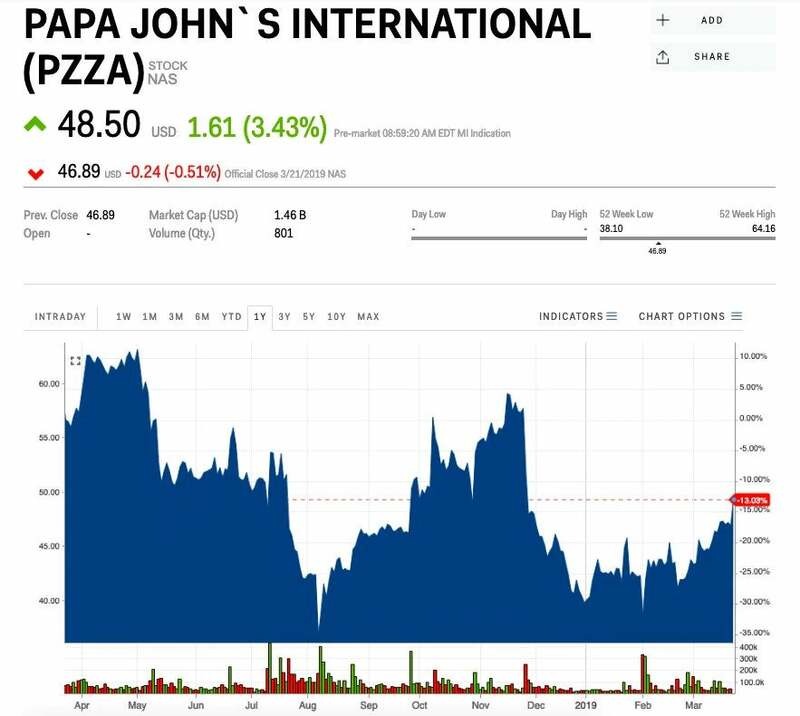 Papa John's was up almost 18% this year through Thursday, trading near $47 a share.